BEIJING: The Taiwanese leader’s trip to the Americas starting Saturday will be scrutinized by Beijing for signs that the incoming US president’s team will risk its ire by further engaging with the self-ruled island China considers its territory. 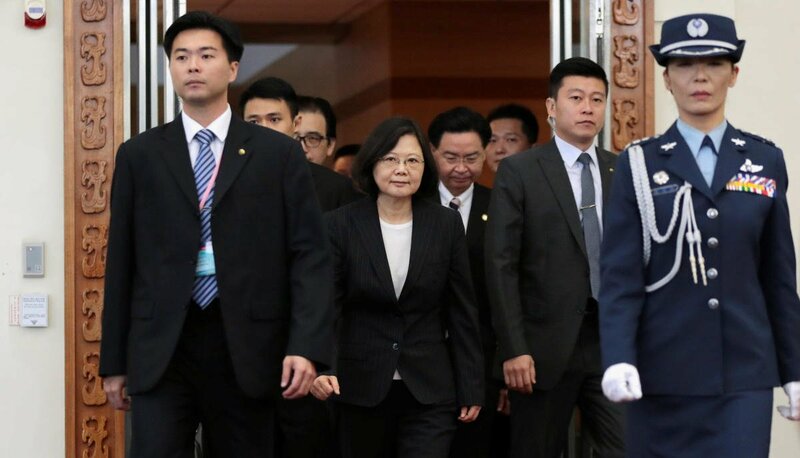 President Tsai Ing-wen pledged to bolster Taiwan’s international profile as she set off on a trip to reinforce relations with diplomatic allies in Central America, a task that has taken on new urgency as Beijing ramps up efforts to diplomatically isolate Taipei. Beijing regards the self-governing island as part of China and officials complained after President-elect Donald Trump last month breached diplomatic protocol by speaking by phone with the Taiwanese leader. Trump raised further concerns in Beijing when he questioned a US policy that since 1979 has recognized Beijing as China’s government and maintains only unofficial relations with Taiwan. US lawmakers often meet with Taiwanese presidents when they transit through the US — most recently in June, when Tsai met in Miami with Republican Sen. Marco Rubio of Florida. This time, it was not clear if Tsai would meet Trump, though some observers said a meeting with Trump’s transition team could happen despite the risk of Beijing’s anger. “It should not surprise anyone if the incoming president’s advisers who will be working on Asia policy meet with President Tsai,” said Ross Feingold, a Taipei-based senior adviser at D.C. International Advisory, a consulting firm whose chief executive has been consulted by the Trump transition team. Regardless, Tsai is likely to keep the US stops low-key to avoid further inflaming tensions with China, which has been angered by Tsai’s refusal to endorse Beijing’s concept that Taiwan and the mainland are part of a single Chinese nation. Beijing says failing to endorse the one-China principle would destabilize relations and hurt peace in the region. In late December, in what Beijing called routine exercises, China’s first and only aircraft carrier and a fleet of warships sailed past Taiwan’s south, prompting Taipei to deploy fighter jets to monitor the fleet. In Central America, Tsai will focus on strengthening ties with allies to fend off Beijing’s efforts to draw governments away from Taipei and further diminish its global presence. Beijing and Taipei have competed for allies for much of the nearly seven decades since the end of China’s civil war in 1949, when the defeated Nationalist government fled across the Taiwan Strait. Tsai, who is leading a delegation of 120 people, will meet with most of the four countries’ leaders and attend the inauguration of Nicaraguan President Daniel Ortega. She said she would also interact with the heads of state of other countries at the inauguration. Beijing has intervened to prevent the island’s participation in international forums and established diplomatic relations with former Taipei allies Gambia and Sao Tome and Principe. The moves have been seen as effectively abandoning the unspoken diplomatic truce that lasted eight years under Tsai’s China-friendly predecessor. Just 21 countries and governments, mostly in Latin America and the Caribbean, now have official ties with Taipei. Observers were watching to see if any of the four Central American nations might defect despite Tsai’s efforts, but say stronger US support under Trump’s administration would help balance future diplomatic losses. “We should expect that in the Trump administration the US would be more vociferous and emphatic about Taiwan’s participation in international organizations,” Feingold said.